By using proper images in blog post will not only make your post designable but also attracted more and more visitors. Adding proper dimension images in blog posts is a prominent job & also very very essential for SEO. Such images give an illustrative mapping help to readers. So what if we have used & added a random dimension images in earlier post and now we want to resize all of them at once. Is it possible to decrease or increase image size in all posts automatically. Since from the couples of days we received bundles of email asking for helps is there any way to resize all previous posts images instantly. Yes surely we could easily customize all these photos by playing with a little Css Code. 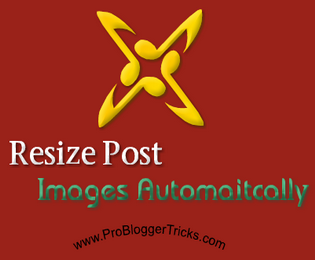 So in this article we will show you how to resize all post images automatically in blogger blog. Why We Need to Resize All Images in Blogger ? There are following reasons why we need to customize these photos by giving proper dimension. Sometime we have used large magnitude or large dimension images which oftenly crossing the content borders. This will make our posts view ugly and readers will not satisfied with complete illustrative views. By adding proper and exact match images according to your posts width and size robot will take it easier in understanding & will get fast indexing. By using always same width & height images in post, guys trusted me it will surely increase your page loading speed faster several times. So we could easily decrease page loading time by applying this technique. How to resize all Photo Automatically In Blogger post. Manually: You could resize all the image manually but what would you do if your blog has hundred and thousands of photos. you can absolutely edit all of them if you still want to do so but it will take months or dozens of days. Do not Miss: 7 Tips To Optimize Images for SEO. Automatically: So therefore it will be more essential to customize and resize all of them through Css codes. Now in this method you have not to go anywhere or no need of editing your images one by one. Just go to template & make some changes in css codes thats is. By applying such technique, after some time if you want, then you could easily revert all images through theirs original size. This is a very simple trick. You could easily customize this by following simple steps. Guys this was a little tutorial about the resizing of old images used in posts. We hope that this technique would help you. If you are facing any problem in customization then kindly post your queries in comments section. We are here by 7/24 to serve you better. Please do not forget to share your views if you know better way. Love & wish You All the Best. what a post brother? A small piece of cake would be valued for more. Thanks for that tip. Yes Tharun Bro its a small piece of code which allow us to turn image in any manners. We are easily give any dimension. Tharun Bro i could order you a .com domain. But why did you not buy its your self. Its not a difficult job. Just register with any hosting company send the money through bank and get your domain thats is. Bundle of thanks Saqib Bro. its indeed a very helpful trick by which we could easily give proper dimension to posts images without editing them manually. Thanks brother great post. i think k manually image ka resize krna aik desi treeka he or ap k treeke k mutabik aik modern method he. brother pehle main Mustfa brother k blog k through ap k blog pe Ata tha per main ab drect ap k blog pe visit krta hun. Thanks Rana i like your words what you have told about us. Its a great news for us that you visit us directly with joys. Do,nt mind please try to leave your comment in English, if you do the same to post your comments in Urdu then it would become difficult for robots to understand it. Always try to mention your queries in English. hope you may understand. Awesome Trick.. I already know about this trick but its very useful for newbies :) Thanks for sharing with us.. Yes Zeeshan Bro its a very small trick. we have published because we have no time for blogging due to crisis if Electricity and more and more loadsheding. So these days we will just published tutorial for newbies. Thanks for landed with us. Wow Wow HAfeez bro Take it this is Bundles of Wow For you in this post u mention that how could we re size images in our blog posts yes i totally agree with your instructions i think images is very Impotent to gain more visitors from Search Engines and images size is also very impotent factor in seo this is also save our blog posts load timing And images helping to readers that they understand easliy by watching images. well thank u so much for this instructions thanks for apprised me and to others. We agree with your words. Yes Rizwan Bro this really a nice tricks by which we could easily resize post images instantly. Newbies are advised if they want proper dimension images in post without manually editing then follow this tutorial for better understanding Thanks my Sweetest Rizwan Bro. Hafeez khan....can you give the code of wordpress subscription form for your gadget code not your tutorial code if u wise please give me the code..
My Dear i do not understand your words. What you mean thats. Please mention your query Again hope we will surely do your work. First thanks for such a useful information. That is one of the great problem for the Newbies and with such a great information, I think it will not remains a problem any more. Second, As you have told me to not call you sir. Inshallah from now I call you brother. And I hope our relation as brother and blogger will remain for ever. Bundles of Thanks Jamshaid Bro. As i want to say something to you. You are my loyalest reader then why are you inserting blog url in comments body. I think you are not aware the fact of google penguin penalty. If you are doing the same thing mean adding the blog url and promoting your website in this way then penguin 2.0 will surely penalized you. Yes you could promote your blog by leaving a comments on commentluv enabled blogs not here. If you want to know what is commentluv blog then read the below tutorial. Same size images looks awesome in our posts. And it being easy for us to write post in same format. Yes My Dear Same size image bring beauty in our post. Now we could easily turned out all the random dimension pictures into same size by this mini trick. Have a great time with Ankit Bro. Thanks Dear, its indeed a good trick by which we could easily resize all the images used in posts without editing them manually. Dear It will take some hours to get a good domain name. When i was searching for domain it took me 2 weeks. So we will suggest some names. But as for now i will give some tips. Choose your Topic, If your topic niche is Blogging tips. Then use google adwords tools and find all the targeted and visited globally words. Take ideas from there. When you find a name then inform me. I will also suggest some names but bro you will have to wait for this job. Because this is the first step before attending in blogging career. Wish you best of luck. Good but there is two major problems. 2: by keeping the full name. probloggingtechniches.com it will look more lengthy that no one will remember it easily. Your post is awesome bro, same size to all image in blogger will really save a formation time, I am using following code in my blog. if the any image in post having width higher than 700 than it will automatically appear in 700px width only..
and rest image in post which having less than 700px width will have no impact on size..
Wow 100% agree with you Umesh Bro. You know this mini trick very well. thanks and hope to see you here in my next tutorial. Thanks Victor for landing with us. this is really an awesome tutorial help in resizing old post images with little trick. i have a difficult to find a tag ]]> since blogger change the template code. I can not even add a google adsense code inside of post just after title. I am asking if you can brother make a post about it. This new template make me confused. waaaw..What a site...great templet..Nicely understand how to manage image in site in a better way..Really so happy to see such a nice site...Is it from wordpress...? Thanks for this helpful post :) just one question : when I added the code , the posts works fine, but the Home Page images is messed up and all of them turned huge ! can I do that with the images inside the posts and not the Home page ? decrease the width 500px to 400px hope this trick will solve your problem. thanks. I did that, but whenever the width of the picture decreased on the home page it's also decreased on inside the posts! my question is : can I have a specific width inside the posts but the home page images still small as it was ? this was really helpful thank you. This was exactly what I have been looking for...forever! I am also looking for the code to automatically align all images to the left. I am trying to load a new template and would like all the photos from all my previous posts to be aligned on the left. I just don't want to do it one by one! A code/css code to move them automatically must exist. Thank you for your wonderful blog and expert tips. I am not sure if you are still reading comments, but I do have a question. I have added the code and it works for new posts, but it doesn't do anything to any of my old ones. Is there something I can do to get it to work for all of my old posts as well?